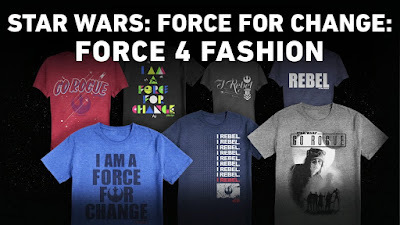 Video: "Star Wars: Force for Change: Force 4 Fashion"
"The Force 4 Fashion line was designed with support from Riz Ahmed, June Ambrose, Steve Aoki, Camilla Belle, Gareth Edwards, Felicity Jones, Diego Luna, Olivia Munn, Kelly Slater, and Brittany Snow, who’ve all been active in supporting different causes through their careers. 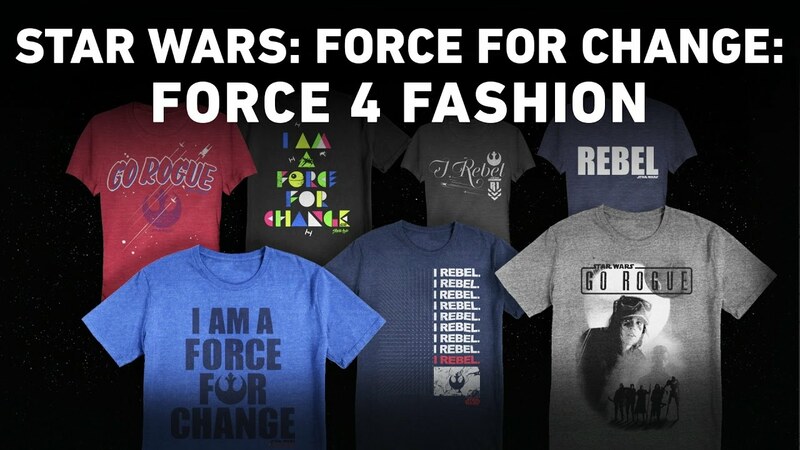 In addition to purchasing the special T-shirts, fans can join the rebellion by sharing their own inspiring stories and posting on social channels how they are a #ForceForChange on “Giving Tuesday,” November 29." You can see all the designs and purchase your t-shirt here.